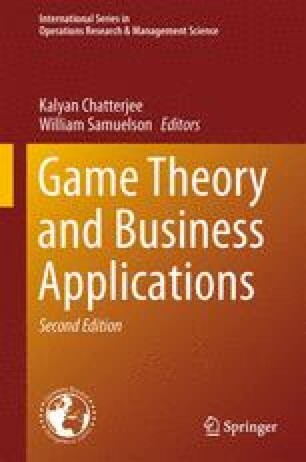 Accounting from a game-theoretic view posits that accounting data affects, and is affected by, strategic interaction within and across firms. This view holds that the accounting process alters the strategic interaction among agents, by impinging on their incentives and on the contracts they make to constrain their behavior. This chapter considers three main topics. First, the principal-agent paradigm is used to provide insights into the design of performance measures to alleviate moral hazard, including the ex ante control of agents through stochastic monitoring. A second focus is on accounting mechanisms, such as budgeting and transfer pricing, so as to coordinate inter-divisional activities within a firm in the presence of goal conflicts and information asymmetries. These two themes constitute the core of game-theoretic approaches to management accounting. A third focus is on the recent literature concerning auditor hiring and audit pricing in the presence of adverse selection. This work illustrates game- theoretic applications in an area that has traditionally been viewed as “markets” driven.